In a large bowl, cream the butter, add the sugar (and vanilla), add the egg, (salt,) lemon peel and sour cream. Mix the flour and baking powder and add that. Pit the plums, splitting them into halves or thirds. Grease the pan and spread the dough. Liberally spread plums over the dough, meat side up. If the plums are sour (as opposed to just tart), sprinkle them lightly with sugar. To make the optional Streusel topping, cream the butter, add flour, sugar and cinnamon. Sprinkle over the plums. Bake for 30-45 minutes in the middle rack at 375 degrees F. Be careful not to let the bottom burn! Serve liberally topped with freshly-made whipping cream. NOTES:* A Bavarian plum delicacy for dessert - My mother and grandmother make this Bavarian specialty without a recipe; this recipe is from my mother, after I pressed her to write it down so I could make my own. It also includes variations from a few other folks that you might like to try. Roughly translated from Bavarian to German, this is Pflaumenkuchen, which, roughly translated from German to to English is Plum cake. However, Zwetschgen aren't ordinary plums, a Datschi isn't really a Kuchen, and a Kuchen is most definitely NOT a cake! This dessert is made of the slightly tart Italian plums, which are unfortunately only available at certain times of the year. Don't try to make it with ordinary plums; they're too sweet and too juicy. Yield: Fillsone round cake pan. * A Datschi may actually be made with any fruit; I happen to love it with Zwetschgen the best. * I don't know this with Streusel on top, and never prepare it that way, but several of my acquaintances swear by it. Made with other fruit, I would be more likely to accept the Streusel. 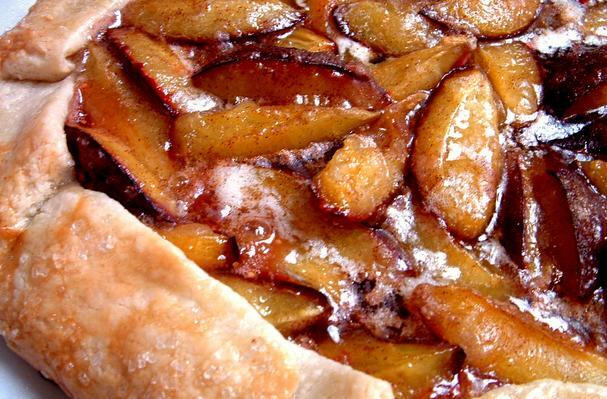 * If you like, you may sprinkle rum or cinnamon over the fruit before baking. Also, you might try substituting rum for the sour cream in the dough, or just adding both. * If you want to make a cookie-sheet-sized Datschi, simply double the recipe. Time: 20 minutes preparation, 20 minutes baking. Well, this recipe sure got re-edited so that it is nothing like mine! My Bavarian mother always sprinkled the plums with cinnamon sugar. The pastry is close to my mom's, but she never added sour cream. However, I'm game to try this version. Streusel? Never! Again.... it's worth a try. We've changed our system so that now recipes cannot be edited, except by the author and Foodista staff. I'm sorry your recipe got edited before we made that change! Please feel free to change it back to your original version or send me the correct recipe and I will make the change. Hi there! Seems that the quantity for sugar is missing, too (it just says "cups of sugar"). I am making this recipe as I write, so I just added 1/2 cup sugar...hope that is right! Foodista removed the ability for others to edit. I don't recognize this recipe any longer. I hope that it turned out for you, but trust me-- this is not my original recipe. Someday, I'll write it all over again. If you go to my blog, I have my own easy version.